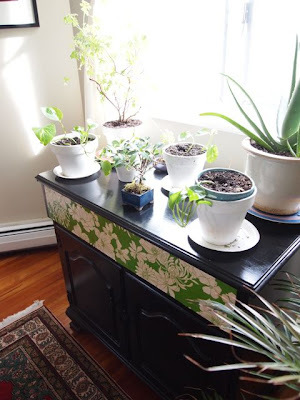 I was inspired by this post over at Frugal Girl. I loved the pictures of her furniture and felt empowered to try finding and painting furniture suited to our needs. Up to now I've been an ikea person because I didn't know any other way... I picked up this little cupboard down the street-- it was brown and dusty with old hinges and keyholes. After painting it, it's replaced a bookshelf and table that used to be side by side (one holding Noah's toys, the other supporting my plants). Here, I'll talk about how to acquire and improve such great furniture. Seriously. 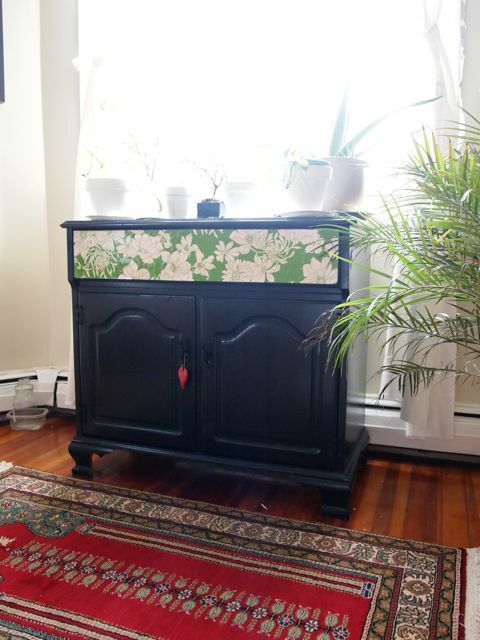 I see these pieces in plentiful supply on trash day, and they come up pretty often on freecycle, too. Wooden furniture is super resilient and bad looking tables look great after a coat of paint. This can be challenging in Boston, where the weather is terrible but you don't necessarily have a spot where something can just sit. If you do have to keep it in your living room, you can probably finish it up in just a couple of days. Try to keep it somewhere where there's at least some air circulating. By removing these now, you'll be able to get a much smoother paint job. Step 4: Choose a paint you like, and go to it! The paint, in my case, was free, but if you have to buy paint, it'll cost about $12-14 a container, and a container will last you several pieces of furniture. After painting pieces both white and black, I tend towards the black. It's more forgiving. Fear of the need to sand was one thing that was holding me back, because I knew there was no way I'd get around to picking up the power sander. I think sanding is important (I did do some minimal hand sanding), but if it's between not doing anything and skimping on the sanding to get you started, don't stress too much about the sanding. Don't worry about the "right" way just yet. Just try it out. Thin coats of paint are THE key tip to take away from this post. I mean REALLY thin. Better to paint 8 coats, each 2 hours apart, than a couple of thick layers. Eug had the genius idea to add paper to the top section of the cupboard, above the doors. I think this is the key feature of the cupboard now. I love it. We just found a sheet of paper, stuck it on using school kids glue, and started varnishing. It took several layers of varnish to start to look shiny. We used water-based varnish, which really helped with cleanup. 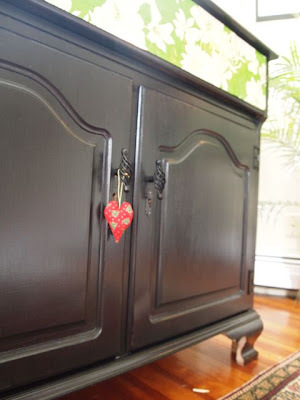 Replacing the doorknobs on this cupboard cost about $4, but made a big impact on its overall look. I just painted over the old hinges and keyholes, as they were too old to come in a standard size.